I’ve wanted to get chickens for a while now and my wonderful wife got me six baby Araucana chicks for my birthday. So now I had to figure out a way to house them once they were grown, and not go broke in the process. 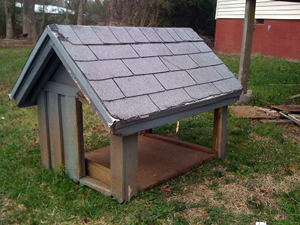 The old dog house with the sides and back cut out. 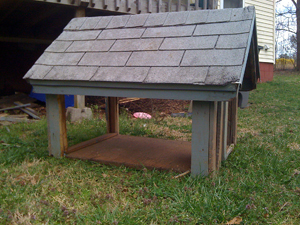 I decided to take my dogs old dog house that she never uses and convert it to a chicken coop. I cut the sides and back out. Obviously the dog house by itself would be a little small for the six baby chicks so I made nesting boxes for the sides and back. Essentially double the square footage in the coop. 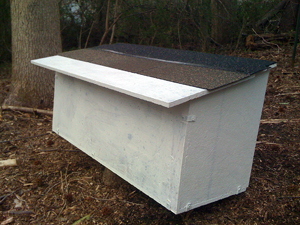 I made the nesting boxes with a hinged roof so I can gather eggs and clean the coop. I used plywood that I sealed to protect it from moisture. I reinforced the lid with a board that I screwed through to attach the hinges. 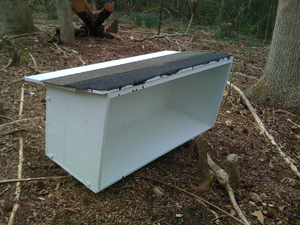 Another shot of the side nesting box. 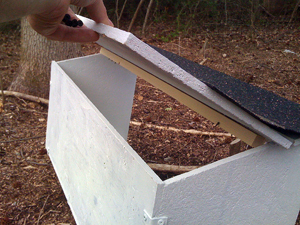 I used the same design for the back nesting box. 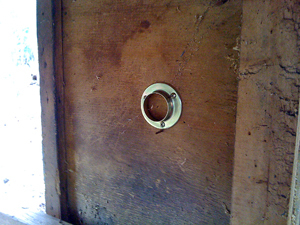 On the inside I’m using a old closet rod for a perch in the new coop. This is the mount for the old closet rod that I’m using for a perch. I then attached the sides and back. 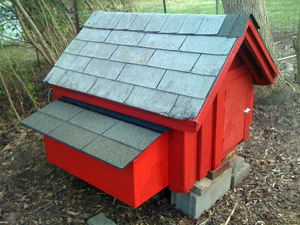 This is the dog house with the side boxes attached. I also cut a door for the front. After all this I painted it red. This is the final coop. 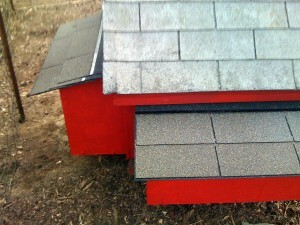 I added 3 tab shingles to the sides and back. I still need to finalize the foundation. So this is it. Please leave a comment and let me know what you think. 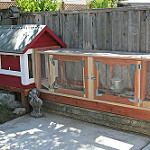 Do you have a cleaver chicken coop design. Let us know. Great idea and execution! The red barn look is cute. I love what you did with your chicken. Very innovative! I love araucanas, too! Did you put perches in for them? I heard that their digestive systems don’t work properly if they don’t roost at night – I think they are slightly rocked forwards if they are standing. Could be an wives tale, but came from a pro chicken breeder & is a natural behaviour after all .. 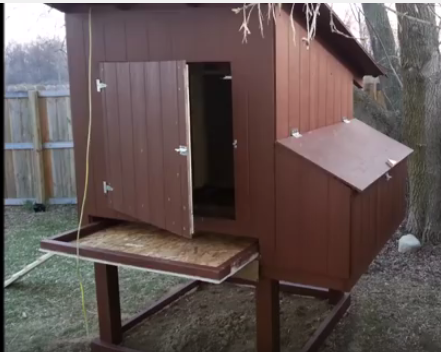 Yes I put a roost in the coop. It’s fun seeing them all in the coop sleeping on it. 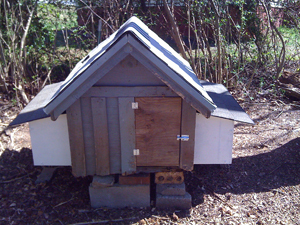 The weird thing is that mosquitoes love the coop. I need to find something that will control them a little better. 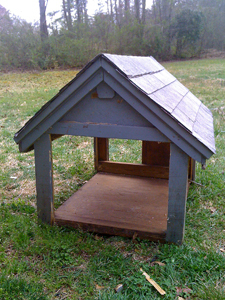 Way to go on the creative re-use of the shunned dog house! 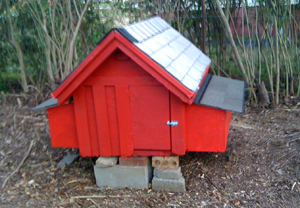 The small coop looks great and is an inspiration for me to build a small one to possible house a future flock. 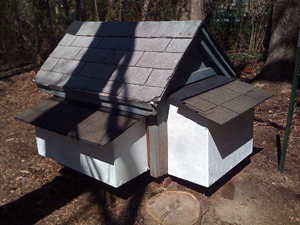 I was impressed by the conversion from dog house to chicken coop! Just shows what some imagination and DIY skills can do! Are you planning to add a ladder to the coop when you complete the foundation? We keep horses, goats,cats and dogs, mostly abandoned and homeless. I may adopt your modifications to house 3 of our dogs a mother and her two puppied (9 months old but small) as they live and sleep together, but I can’t think where to put the perch? 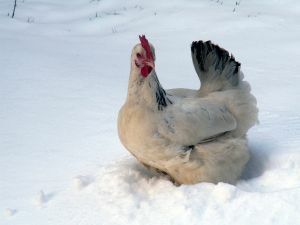 I’ll be back to see your coop again! 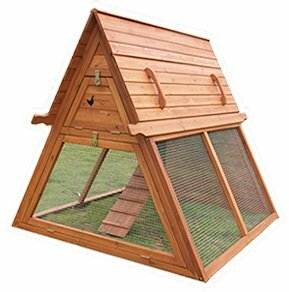 I am researching custom chicken coops for an article to be written by a journalist friend of mine. Where are you located? Are you near Pismo Beach, California? Hope to hear from you soon! I love this idea I have been scouring the web for ideas. My husband got us six chicks for Easter. Thanks again for shareing. Wey hey! 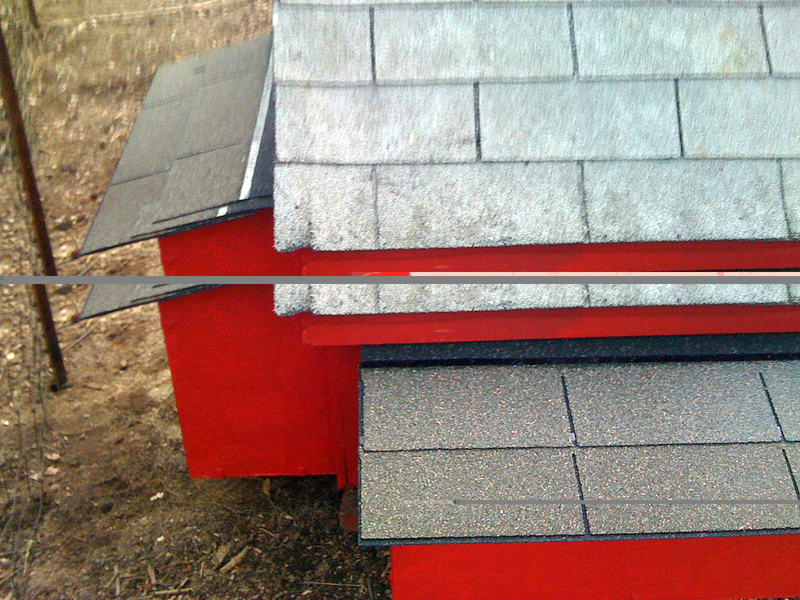 What a dudey little hen house – loved it in its early stages even – like an old house — but the red! Wow – excellent job!